What To Feed Chihuaha That is Allergic to Wheat? Q How can I improve my 4lb, 14 month old, Chihuahua's life if she is allergic to wheat? I give her wheat free food & treats but her fur is still dry and falls out a lot! Also, how do feel about giving my Chi's "meaty bones" to help fight against tartar? Are the dogs to small for these bones? A: Many pets and people are allergic to wheat and grains. In general, I do not recommend giving pets any grains because they can trigger allergies and a lot of health problems. It sounds as though your dog could benefit tremendously from Omega 3 fatty acids. 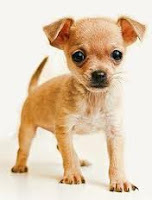 Since your chihuaha is very sensitive, you need to be especially careful about using fish oil. This is because there are a lot of contaminants in most fish oils which can cause even more problems. Try the Amazing Omegas as the oil will quickly help your dogs coat and reduce shedding. Also, using a multi-strain powerful probiotic such as Power Probiotic will help your chihuaha's overall allergies and teeth. Usually pets accumulate tartar when htey are not digesting their food properly. Using a raw frozen diet that contains ground-up bone is a safer choice for such a small dog.